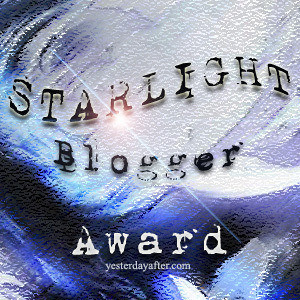 I was so excited to find that My blog has been Nominated for the ” Starlight Blogger Award” and a huge thanks to Veganacvocate1988 https://thisvegalife.wordpress.com for Nominating me, please check out his blogs!! so awesome and informative! •Thank the person that nominated you and link back to their blog. •Answer the 3 questions that are given to you. •Pass the award on to 6 other bloggers of your choice and let them know that they have been nominated. •Include the logo of the award on your blog, please never alter the logo and never change the rules. 1. What is your perfect date? My perfect date in honestly just getting some take out and watching a movie at home with my significant other 🙂 but if I am feeling adventurous would love to go walk around town and discover new and exciting local shops and resturants! 2. If you could meet anybody in the world, who would it be and why? this is a tough one!!! This probably sounds silly, but I would love to meet Director: Spike Jonz… I have always admired all his work and want to pick his brain and just breathe the same air… or something 🙂 He is a film god!!! A Smoothie Affair who inspires me with her beautiful and colorful posts everyday! Online Beauty Finds who always leaves me the sweetest messages and an awesome beauty Blog! 1. If you could change one thing about the world in the next 10 years what would it be? 3. what is your favorite animal & why? Previous Sun & Earth will save your life! Congrats to you! I really enjoy your blog 🙂 Good luck! – Meeting amazing people, around the world! Thanks so much for the nomination and sweet comment! ❤ That ideal date does sound ideal, though. =D Nothing beats a good movie and good food. haha 🙂 right? I feel like I should write.. walks on the beach or something, but who really does that! !